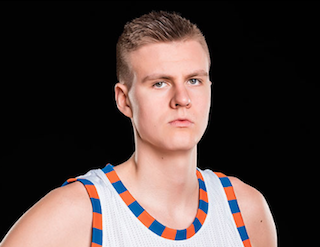 Kristaps Porzingis—the New York Knicks rookie/best player in the NBA—is Slam’s latest cover star. He has legit three-point range; a wide-open jumper almost always becomes a bucket. He’s intense on the offensive boards, crashing in and slamming home put-back dunks over hopeless defenders that he’s become known for. His long arms and impossible length help him maintain relevance on defense, even without the strength or muscle mass of his older peers. And he moves nicely, too—at 7-3, there isn’t that gallop in his step that you see in some goofy, seemingly injury-prone big men.